The most exciting, important and dramatic Scriptures in the Word of G-D, the Scripture is a most misquoted and misunderstand which resulted in confusion for many. It is on the first place the Book of the revelation of the Messiah Yeshua or Jesus Christ! Not only just read but study these Chapters with an open heart, involving the Holy Spirit in your progress. Through an angel of the Yeshua Messiah; He Himself released the revelation to His own Apostle John! Especially we now live in the End-Time and to the soon returning Lord, we as Christians need to understand in which prophetic time cycle we live today by going to understand by studying the Book of Revelation and related prophecies by the ancient prophets! Today G-D is opening His servants who will have an open mind the understanding revelation about the visions written by Apostle John. 27 But the anointing which ye have received of him abided in you, and ye need not that any man teach you: but as the same anointing teaches you of all things, and is truth, and is no lie, and even as it hath taught you, ye shall abide in him. (1 John 2:27) There is no need of any new doctrine or any instruction from the seducers. John does not teach that saints have no further need of gospel ministers, for God has sent Holy Spirit filled men & women of G-D in the churches to teach, to instruct and edify. The Book of Revelation describes also that day when the Lord will return to earth. That Yeshua Messiah will come with the clouds of heaven summarizes the message of Revelation. Yeshua’ second coming will be visible and victorious. Everyone will see Him arrive (Mark 13:26), and they will know it is Yeshua; Jesus. When the Messiah; Christ returns, He will conquer evil and will judge all people according to their deeds (Revelation 20:11-15). Even those who pierced Him will see Him, (see Acts 2:22-23; 3:14-15). John saw Jesus’ agony & death with his own eyes, and he never forgot the horror of it (John 19:34-35). However, all people across the ages who have rejected Christ have themselves “pierced” Him with their indifference to His sacrifice on their behalf. All the nations of the earth—both Jews and Gentiles—will weep because of Him. They will mourn because they know they will be facing God and His judgment and will be destroyed. The term "testimony of Jesus/Yeshua," which is "the Spirit of prophecy" (Revelation 19:10), proves it to be all prophecy, for it is "the Word of God" and "the testimony of Jesus Christ (Yeshua Messiah)" which compose "all things that Apostle John saw." This Book of Revelation reveals G-D's Divine plan and purpose for this End-time and unveiled before the eyes of Apostle John! It is indeed a Book with revelation-power where you can experience with excitement and great expectation concerning the things which will happen very soon! 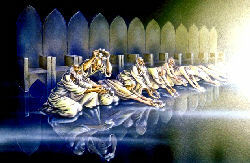 It is not the will of the Almighty G-D that the Book of Revelation to remain a mystery to you. The (prophetically) events that are happening on our planet Earth are not co-instantly, but careful planned and developed from the beginning of time! G-D has revealed His End-Time-Plan to us today! How closer we are to the coming of Christ, how more G-D's own people will receive greater (End-Time) anointing, which new breakthroughs in revelation concerning these End-times; greater and mighty works of G-D through them in order to be in the plan of G-D mighty End-Time Army! The prophecies & revelation were not given only to comfort, strengthen, educate and encourage saints in John's time, but to reveal the great final victory God has planned for us as righteous saints and to prepare the coming of the Lord Yeshua Messiah! The purpose of the Revelation is "to point out to His servants the things which must shortly come to pass. The truths in Revelation can be generally understood from its own subject matter, although the details are often more fully elaborated in other Scriptures. Many truths which have been cloaked in mystery during the past ages, even to the ancient prophets, are now clearly revealed to us through this book. John saw certain things prophetically and understood the meaning of his writings while other prophets did not (always) understand many of their prophecies. The Revelation had its origin in the mind of God. The things contained therein were in His mind from eternity, but were not given to Christ (Yeshua Messiah) until after He was exalted as the head of the Church. "God gave unto Him" this Revelation! The Title of Revelation: Men call the book "The Revelation of St. John the Divine"; G-D entitles it, "The Revelation of Jesus Christ." The significance of the word "Revelation" must be understood. The words "Revelation" and "Apocalypse" are synonymous and are derived from the Greek word "apokalupsis", meaning "to unveil, reveal, or uncover". It means "to lift up a curtain" so as to clearly show what had been covered. The Book of the revelation has 404 verses in 22 chapters. 54 verses are history and 350 verses are prophecy. 1. "The things which thou hast seen," i.e., the vision of Yeshua Messiah or the Christ the High-Priest in the midst of the candlesticks! Revelation Chapter 1; the vision of Yeshua Messiah or the Christ the High-Priest of Heaven after the order of Melchisedec in the midst of the candlesticks with a priestly garment! Whither the forerunner is for us entered, even Jesus, made an High priest for ever after the order of Melchisedec. (Hebrews 6:20) Melchizedek was an earthly king & priest (Genesis 14:18-20; 7:1-28) Melchizedek's origin was not recorded (Hebrews 7:6) so he could be a mere type of Yeshua's/Christ's eternity! 2. "The things which are," i.e., the seven letters to the seven churches in Asia Minor, or present-day Turkey. Present condition for John. 3. "The things which were to come," i.e., events after the rapture of the church (The great assembly of the righteous saints) (Rev. 4:1 -- Rev. 22:5). This deals with the future! These include the scenes in Heaven (Rev. 4 -- Rev. 5), the seven seals and their parenthetical statements (Rev. 14:1 -- Rev. 19:21), The second Coming of Yeshua as a warrior King, ending the war at Armageddon; the Millennium (Rev. 20), and the new Heaven and new earth (Rev. 21:1 -- Rev. 22:5), and events of the conclusion! Beginning 5 centuries before the birth of Yeshua Messiah, told to the Prophet Daniel who was totally committed to God, we are given the privilege of seeing the panorama of history until the End Times! Our world today is similar to the world God judged with the Noah's flood catastrophism! But just as God rescued righteous Noah & his family, so God's prophetic calendar tells us that we will be rescued before His judgment falls in our End-Time Day! These two comings should not be confused. The scriptures that apply to one do not apply to the other. Not one passage refers to both events as if they were one. These two distinct comings are separated by several years, so they aren't two stages or phases of one coming. Rapture...the great assembly of the saints! The second coming is the time the Lord comes to the earth to live here and fulfill a mission on the last day of tribulation. 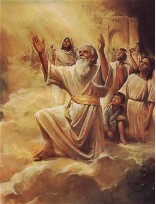 This is the time He comes from Heaven with the saints, having raptured them at least seven years before. The second coming cannot take place until all of Revelation 1:1-19:21 is fulfilled while the rapture can take place any moment without anything being fulfilled! It is Yeshua who is a Priest who are becoming a King; The Heavenly temple is not just the Throne room, it is the real Temple of G-D in Heaven. All these judgment in the Book of Revelation are actually judgments predicted by Old Testament (ancient) prophets, that are found all summed up at ones in the Book of Revelation. Isaiah predicted cosmic signs; Jeremiah predicted the tribulation; Joel predicted locus like men; Daniel predicted the 70 TH week and more; etc... The Book of Revelation is not a new vision, but is a combination what all the Ancient (OT) Prophets saw coming to pass during a 7-year time-frame in the wrath of G-D on the Earth! 1. There are 6 judgments in the 7-sealed Book (Scroll); The 7-TH seal is silence! 2. There are 7 angels with trumpets; 6 judgments; than the 7-TH trumpet; it is finished! 3. There are 7 angels with bowls; 6 judgments; than the 7-TH bowl; it is done! 3x- times 6 judgments; + the 2 "woe's"; 6 is the number of men! ......and in doomsday scenarios in various other non-Abrahamic religions. In Christianity, the End Times are often depicted as a time of tribulation that precedes the Second Coming of the Christian “Savior“ or a “hoped-for deliverer”, Jesus or Yeshua, the Christian Messiah, who will usher in the Kingdom of God and bring an end to suffering and evil. In Judaism the term “End of Days” is taken from the Tanakh, Numbers 24:4, as a reference to the Messianic era and the Jewish belief in the coming of Mashiach Various other religions also have eschatological beliefs associated with turning and redemption. In Islam, "Yawm al-Qiy mah" "the Day of Resurrection" or Yawm ad-Din "the Day of Judgment", Allah's final assessment of humanity, is preceded by the end of the world. Behold, the Lord cometh ... The first New Testament prophecy in (Jude 1:14-15, unfulfilled). This refers to the second coming of Yeshua/Christ with all the resurrected saints who will have been raptured at least seven years before this (2Thessalonians 2:7-8, notes; Zechariah 14:5; Revelation 19:14). The angels of heaven will also accompany Yeshua/Christ to earth at this time (2Thessalonians 1:7-10; Mt. 16:27; 24:29-31; 25:31). (Where Jude learned of this prophecy is not known, unless it was from the book of Enoch which was known in the early church. Origen, Tertullian, and others mention a book by this name). To execute judgment upon all, and to convince all that are ungodly among them of all their ungodly deeds which they have ungodly committed, and of all their hard speeches which ungodly sinners have spoken against Him! Ten thousands is an expression of an indefinite number, as in Daniel 7:10; Revelation 5:11. The Book of Enoch is one of the most important non-canonical apocryphal works, and probably had a huge influence on early Christian, particularly Gnostic, beliefs. Filled with hallucinatory visions of Heaven and hell, angels and devils, Enoch introduced concepts such as fallen angels, the appearance of a Messiah, Resurrection, a Final Judgment, and a Heavenly Kingdom on Earth. Interspersed with this material are quasi-scientific digressions on calendrical systems, geography, cosmology, astronomy, and meteorology. These Chapters of Revelation were part of "Living Waters Ministries". (Only basic, the verses with some illustrations) (On February13 2010; the founder of Living Waters Ministries; Steven Burlinger passed away very suddenly! It is a great lost for his family and myself for such a fine man; but the circumstances in Heaven are much better! )(A letter from his sister I have got just before Christmas 2010; where she also is giving me all the copy-right over Steven's web-site) The page's now are complete re-created by the same author and designer of this web-site. Now for reason that "Founder Steven- Living waters ministries' went to the Lord", I had/have to recreate complete all chapters in a new style and outfit, with commentaries added to each verse! (Steven Burlinger Founder of Living Waters Ministries; had given me permission to place all these 22 Chapters under God's Outreach Ministry Int. / End-Time-Harvest-Revival web-site's as well) To create these 22 Chapters of Revelation and there many related page's with all the detailed information has cost a lot of 'Earthly time! These ministries with the Prophetic visions web-site's, and with many Biblical study-notes is always freely available for everyone! Especially for the End-Time-Harvest-Revival - online visitors! As such, these detailed teaching’s site’s cost a lot of precious (study) time and financial commitment for the author/publisher/Ministry of this web-site as well! Every study, that takes you only minutes to read, and many illustrations according the story, takes many hours of work to write, to edit, to design, to format and technically make available & maintain on the web server. That is the simple reality of the situation! Thank you for your understanding! It is a NON-commercial initiative of God's Outreach Ministry Int. Inc. There is no financial benefit of any of the illustrations. It is simply benefit and serving you to clarify the Word of G-D, especially the Book of Revelation! Not all illustrations are coming from the same source! Please do not contact the Christian Artist of www.Revelationillustrated.com before you sure know it is from their source! Not all pictures/illustrations are coming from the same source! Please; go to Contact us and send your e-mail request for additional information of the illustrations! Please, do not contact the Christian Artist of www.Revelationillustrated.com before you sure know it is from their source. By sending your e-mail to Contact us I will give you the correct information and if you can use it as well! Please, respect the copyrights of the several artists of the many kind of illustrations in these web-group of the Apocalypse and related pages!